Mother's day in T minus 13 days! Our orchids are grown around a hoop that creates a lovely arch of falling orchid blooms. 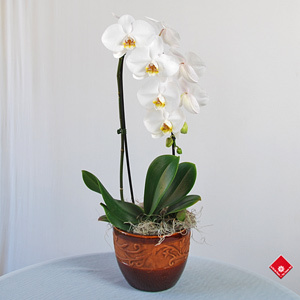 The hoop technique gives the flowering orchid plant a unique and modern design. Come by and visit your friendly Downtown Montreal florist located in Griffintown to browse through all our gift options. If you're looking for a more personalized gift, visit our website, call us at 514-938-1234, or stop by our Griffintown shop (1340 Notre-Dame Ouest) for recommendations, and to place your order.